During her first Far East trip as a young dancer with José Limón, Jennifer Muller's exposure to Eastern culture spurred an investigation into Chinese philosophy, forming a base for her technique's creation. 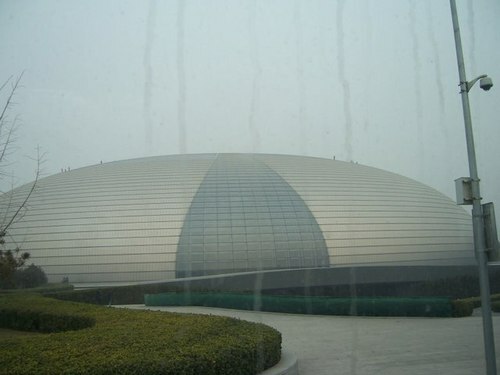 When JM/TW performed in Beijing last week at the National Center for the Performing Arts—commonly called "The Egg"—it was a homecoming 35 years in the making. 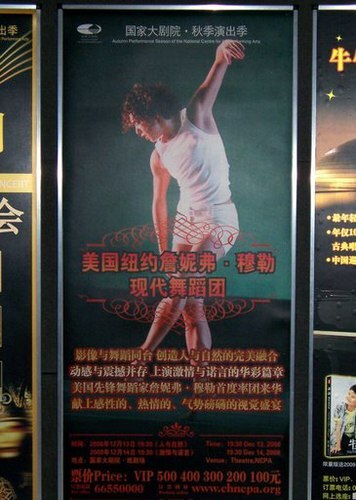 The company journeyed overseas to present two different programs on December 13th and 14th, 2008. Saturday's performance was completely sold out, and Sunday was nearly full. Dancing her most recent works, including Aria (2008), Edge (2007), and Momentum (2005), the cheering audience gave a warm reception that needed no translation. 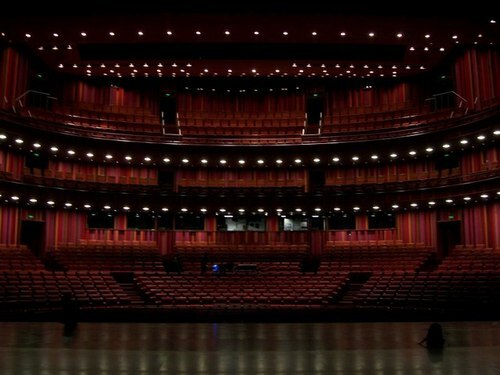 During a pre-show press conference and lecture demonstration on Friday, the Beijing press core stayed to the end, which theater management stressed is a rare occasion. Cameras and reporters swarmed Ms. Muller afterwards; their curiosity and excitement was clearly palpable. Outreach opportunities provided The Works with a deeper introduction to Beijing's growing dance scene. Ms. Muller presented an hour-long lecture at the Beijing Dance Academy, one of China's most prestigious institutions offering higher dance education. Company members Rosie Lani Fiedelman and Seiko Fujita taught a master class at Beijing Dance/LDTX, a non-governmental and independent professional modern dance company. With trips to The Great Wall, Forbidden City, Temple of Heaven, and Chinese markets, the group visited as many sights as possible in six days. Each venue, especially the theater, gave an amazingly warm welcome. The Works has developed a new relationship with China which Ms. Muller looks forward to cultivating and expanding in coming years. Jen Peters is a member of Jennifer Muller/The Works, and a frequent contributor to Dance Magazine and Dance Spirit.